Next month’s MPG Marathon will see a hydrogen fuel cell Hyundai ix35 put through its paces under a collaboration between the University of Birmingham, Lex Autolease and Fuel Cell Systems. Sponsored by ALD Automotive, RAC Business and Crystal Ball, the event takes place 18-19 October based at the Heythrop Park Resort in Oxfordshire. Competitors will be tasked with planning their own routes to four different venues across the heart of the country, including a visit to the iconic Silverstone racing circuit in Northamptonshire, home to the British Grand Prix. 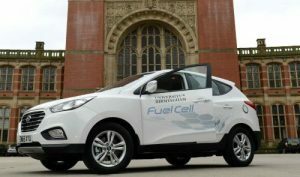 The Hyundai ix35 will mark the only hydrogen vehicle in the event and will be piloted by the University of Birmingham and Lex Autolease, with support from a mobile refuelling unit from Fuel Cell Systems, which will be demonstrated in pre-production form during the event. Although the 2016 MPG Marathon is already heavily subscribed, there are a limited number of places still available for vehicle manufacturers, fleet operators, dealer groups or even individuals to take part.